AmpKit is a great app for simulating guitar amps, effects and recording app for iPad, iPhone, and iPod touch*, now with iPad Retina display graphics and an even greater selection of gear in the Gear Store, including the first full-featured, modern bass amp available on iOS. 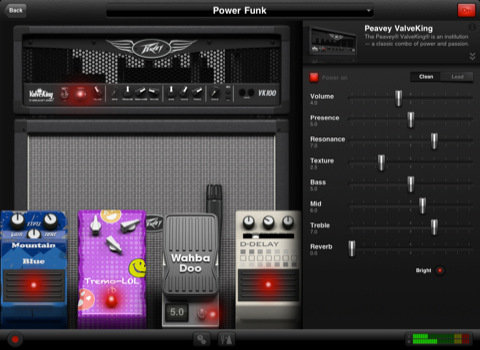 – The largest guitar and bass gear selection of any amp sim app: 36 amp channels, 24 effects, 21 cabinets, and 8 mics. – A massive collection of presets: 114 in total! – Five great cost-saving bundles including the new Summer ‘11 Pack with 6 brand-new amps, 6 cabs, and 4 new effect pedals. – Powerful features including recording session mix down, Audio Copy & Paste, background audio support, and much more. All the gear from the free version: Peavey ValveKing amp (clean and lead channels), 4×12 and 1×12 cabinets, noise gate, overdrive pedal, two mics. – Peavey 3120 amp with clean, rhythm, and lead channels and 4×12 cabinet. – Colonel Vintage amp with 4×10 and 1×12 cabinets. – Vintage Brit amp with matching 2×12 cabinet. – Additional pedals include distortion, fuzz, compressor, chorus, phaser, flanger, reverb, and 10-band EQ! – 20 amps with 36 separate amp channels, each modeled after the actual circuitry of amplifiers from leading manufacturers. – 24 effects pedals, including advanced noise reduction, tremolo, distortion, fuzz, reverb, delay, 10-band EQ, octaver, flanger, phaser, vibrato, chorus, boost, compressor, overdrive, and an all-in-one envelope filter + auto-wah + manual wah with accelerometer tilt support. – More gear on the way! – Support for true high-gain operation. 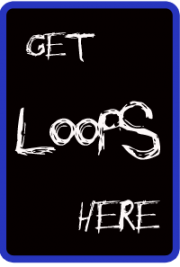 – Run a dozen or more effects at once. – Amazing flexibility and tone control: place pedals virtually anywhere in the effects chain including after the cabinet and before and after the amp. – Effects Only Mode allows you to use AmpKit as an effects processor connected into an actual amp. – 114 predefined amp / pedal presets. – Create and save an unlimited number of your own custom setups with Favorites and Locking. – Share your favorite setups with friends via email. – QuickJump: jump from one favorite setup or preset to another. – Advanced recording: AmpKit creates both “dry” and “wet” recordings. – Ability to “re-amp”: re-record a previous session, applying a new amp and pedals setup. – Recording session mix down: mix down a wet guitar recording with the backing track it was played with. – Audio Copy & Paste: copy AmpKit recordings and paste them in other iOS apps. – Paste audio from other apps into AmpKit, a great solution for multi-track recording. – Instant access to your complete iPod music library so you can jam along. – Download AmpKit recordings to your computer, email recordings, or share using SoundCloud. – Multitasking Support / Background Audio: AmpKit can operate and produce audio when running in the background.